An important step to help you increase your site traffic, online safety tips plus updates on FWF 4 Live. This step can increase your traffic by 100 percent. James Schramko here with an internet marketing news update. I’m going to be talking about how you can increase the rates that you charge and the results that you get for customers will be appreciated even more with this process. Plus, I’m going to give you an update on the FastWebFormula live event ticket sales and we’ll discuss the changes in the marketplace around names and passwords. So this week, Evernote had their passwords hacked and it’s a good reminder not to use the same password on all different websites. Now thankfully, it doesn’t look like there was anything taken that is useful for the attackers and I guess we’ll find out in the future but the point is, make sure you use a different password for each website that you use and if it’s something as integral as Evernote, then you want to make sure that you have just a custom password just for that site. I use tools to make sure that I can randomize my password like 1password, for example. It allows you to generate an encrypted password for each site that you use and then it remembers it on your browser. You could also use tools like LastPass if you have teams for example. I have a paid membership and it’s amazing how many people try and put in the same username and password even though the instructions clearly say “use a different username and password”. It probably happens maybe 10 percent of the time. People put the same name and for the password and for the username and that’s just crazy. Don’t do that for any site because if someone knows your username and then they type that as the password, if the software actually accepts that, then you are really opening yourself up to password theft. So, please generate unique passwords for everything that you use online. There’s now more than 30 people booked for FastWebFormula 4 Live. Make sure you come along. Every single time someone books, the price goes up until it reaches the standard ticket price of 999. So if you want to get in there early and get yourself a saving, go to FWF4 and get your ticket now while it’s the cheapest it’s going to be. I’m really looking forward to the event because I have Clay Collins coming out and Ezra Firestone coming out to talk about their specialties, that’s software and building up an entrepreneurial text startup. Plus, we’ll also be hearing about ecommerce and I think ecommerce is a big deal especially with the collapse of a lot of retail stores, we’re only going to see ecommerce get stronger and stronger. If you have internet marketing skills, then ecommerce is right for you. So how do you get paid 800 dollars or 1,500 dollars per hour for consulting or how do you get 12 or 13,000 dollars for a website instead of a 1,000 or 1,500? It’s all mindset. And one of our members in SuperFastBusiness this week, John Loga posted a few tips on how you could go about changing that mindset and it fits right in with what I’ve always been saying – “Focus on the result, not on the mechanics or the tech specs”. Your average customer knows nothing about internet marketing technical stuff. What they want is the result. They want more sales, more customers, and if you can explain to them value of what you’re offering and how much it helps them, then they’ll be prepared to pay for that solution; so that’s how high-priced consulting works. So check out the threads inside SuperFastBusiness and you’ll see exactly how you can go about adjusting that mindset and add an extra zero to what you’re doing now. Is This The Future Of Online Identity? Now there’s a bit of a “real name revolution” going on. We’ve seen it with Google, with Google+, they insist on real names and it’s now going to be harder and harder to have fake names or avatars or usernames. It’s going to be ‘old school” I think. What we really want to see is transparency online. And the more you use your real name, the more results you’ll get. That’s why in SuperFastBusiness, I’ve changed over a bunch of randomized usernames to real names and I’ve encouraged people to do this. So the process is, send me a private message and I will change your name to a real name. It could be a first name, it could be first name and an initial but the point is when people are dealing with you and they’re dealing with a real person, it’s so much easier when you go and meet each other at a live meet-up, when you go to FastWebFormula Live, when you see people online that have recognized you from the forum, it actually enhances that relationship. So I say “Go for the real name where possible” and I think this will be a continuing trend online. It will almost be impossible to have fake names in the future. Now here’s a tip for converting files. Let’s say you have a WMV file or using GoToWebinar or GoToMeeting and you generate weird files. There are handbreak.fr type software solutions that you can download to your computer and convert just about anything. However, there’s a really easy way to do this with videos especially is to use a Wistia account. You upload your raw file and they will crunch and process and render it into the most available outputs for mp4 for iPhones or for high-end streaming and you can download the version that you choose. So you pretty much treat it like a converter but I also recommend you use their player because it is the best player for videos online. That’s Wistia.com. Is Doubling Your Content Equal To Double Traffic? There was a question post this week in SuperFastBusiness – “If you double content, will you double traffic?” It raised a great bunch of responses especially around “Is it the right sort of traffic?” and “Is that better than having just good quality content in the first place?” Now here’s the thing, most people have just no content. They’ve got almost nothing going on, maybe a five page website just some dribbles and dregs of post. I’ve seen a huge increase in my traffic since I’ve been putting out more content. Now of course my content standard is going to be good. Videos like this are high quality content which also get turned into audios and transcriptions. Now just alone in the month of February, I had over 62,000 podcast downloads across my content distribution points. I also had over 70,000 page views of SuperFastBusiness and over 35,000 visits. Now that is a 100 percent increase from the November-December period. So that means, between the months of February if you just go back 30 days to 60 days ago to November, I was getting half the traffic. So I didn’t really increase the content that much, I probably added another 10 or 20 percent worth of content but what I really did that was different was I added a paid course (OwnTheRacecourse) for FREE. And I can tell you that has driven up the opt-ins, it’s driven up the visits, it’s driven up the page views. 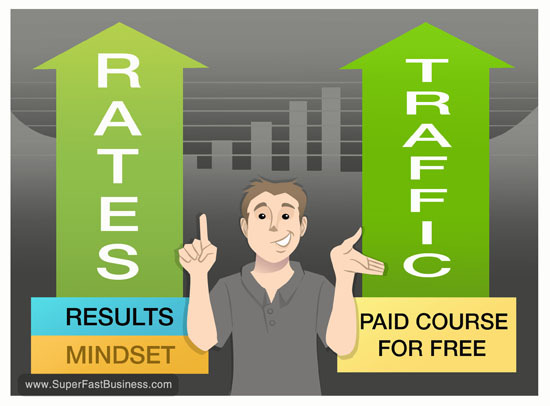 So if you really want to double traffic, my best tip this week is add a paid course to your blog for free and let it rip. Just show everyone in the world what you’re all about, give it away, put it out there and get that traffic coming and you will see an increase in sales conversions because I have. Well I hope you’ve enjoyed this week’s tips, I’m James Schramko and I’ll be coming at you soon. In fact, what you’ve got to look forward to is a fantastic interview I’m doing with Peep – a conversions expert, so look out for that episode coming to you this week. If you have any questions or suggestions, you may leave your comments below.